Please take a few minutes to complete our product evaluation survey. This print resource was developed for the public health workforce and other healthcare providers. 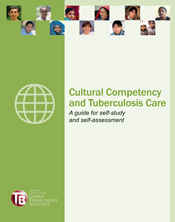 It is intended as a tool to begin to explore the knowledge, skills, and attitudes necessary for cultural competency in general, with a focus on TB control activities. 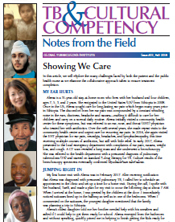 The guide utilizes a culture general perspective and includes a self-assessment tool, teaching cases and links to other cultural competency resources. In this article, we will explore the many challenges faced by both the patient and the public health nurse as we examine the collaborative approach taken to ensure treatment completion. If you require additional quantities, please contact our office at globaltbinstitute@njms.rutgers.edu or call 973-972-0979. © 2019, Rutgers, The State University of New Jersey. All rights reserved.